El Arco is one of Mexico’s most famous natural wonders. 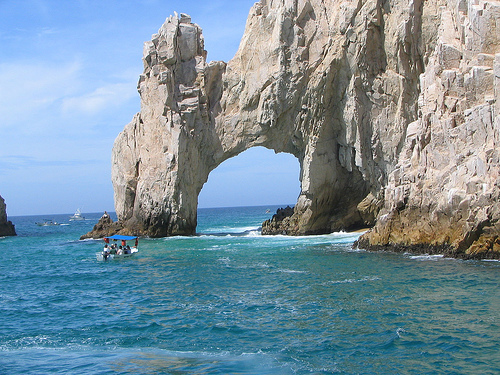 It is a 200-foot granite rock in the shape of an arch situated next to Playa del Amor or Lover’s Beach. This spectacular landmark is often pictured on postcards and souvenirs that depict the awe-inspiring natural aspects of the Baja Peninsula. El Arco attracts hundreds of tourists who come and marvel at its spectacular natural shape, which was carved by the strong ocean currents. Centuries ago, El Archo was used as a hiding place by pirates, who would ambush and plunder merchant ships heading toward the west coast. Today, this unique landmark attracts numerous cruises and mini boats filled with tourists looking for photo opportunities. Stop by the excursions desk at Dreams Los Cabos Resort & Spa to set-up a tour of El Archo during your next stay! This entry was posted in Dreams Los Cabos and tagged Baja Peninsula, Cabo, El Archo, Los Cabos, Lover's Beach, Mexican landmark, Mexico, natural landmark, tourist attraction, unique landmark. Bookmark the permalink. This is a MUST see when you visit Dreams Los Cabos! 4 SURE!